Why dredge a treatment lagoon? Let your biology work for you and your budget! We can remedy sludge accumulations 60-70+% based on organic content. Reduce odors, sulfide liquid. and air readings. Increase biological activity to improve effluent quality and methane production. Reduce sludge, by simply improving the biological pathway. If you have a landscape/golf course pond that is having issues, we can help! A food manufacturer in Florida had a wastewater pretreatment system which was comprised of about a surface acre of area, and a 12 foot water depth. Upon realizing through measurements the system had become full of sludge, we began applying a biostimulant to alleviate the problem. Within less than eight weeks after the initial application, sludge levels were reduced to 5 feet from the initial 12 foot measurement. 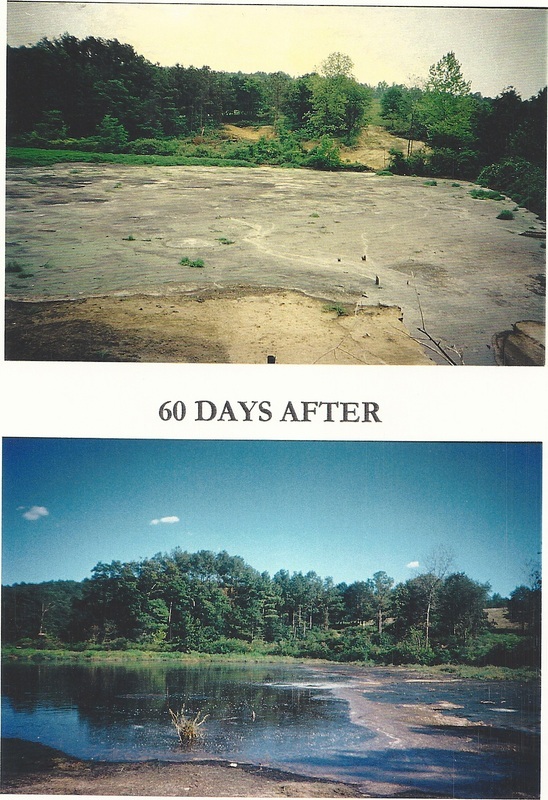 This was a reduction of over two million gallons of sludge. The system was able to discharge to the receiving collection system with no down time for neither the plant nor its employees. A small municipality in Alabama had a treatment system comprised of a three stage lagoon system; its daily flow into the system was about 100,000 gallons. We were contacted to address permit issues for ammonia by this client coming from this treatment system. We began treating two of the lift stations within the city, and applied a dosage of product directly to the first cell of the lagoon, which had a total average sludge depth of 12". The project began in April, and the system was measured the following January showing an average depth of sludge in the lagoon of between 1" and 2". Some of the technical papers we have presented in the past, have targeted the "in-situ" removal of biological sludge from pulp and paper lagoons, when the product was first introduced, extensive work was done in dairy, poultry, swine, and confined animal feedlots. In fact, the lead story in the Oklahoma Stockman magazine, dealt with the use of a biological stimulant.The costs associated with manual dredging, usually are accompanied by "sticker shock" and you will find a simpler approach to these problems using our technology. The sludge is treated where it is; there is no need for dredging, removal, or further treatment of the residuals, also saving transportation and disposal costs.